As a few of you might know, I spent Christmas with my in laws in Alaska. The first time I went to Anchorage was in the summer of 2009. And during that first visit, my now father in law decided to take this “wine snob” (my mother in law’s favorite descriptor for me) to the new attraction in town: Crush Wine Bistro and Cellar. It had just opened sometime earlier that year. It was a wonderful place: a rather small establishment in the heart of Anchorage, a great long bar and small tables filling the room. The staff was friendly and knowledgeable, never overbearing. It just had a good vibe to it. It gave me that feeling of belonging, welcoming me, a place I wanted to be in. Why is it so hard for all too many places to create that atmosphere? Upon looking at the wine list I had to laugh out loud: Certainly, there were Gunderloch wines on the list. Gunderloch is a phenomenon: The winery is located in my hometown Nackenheim and has been available worldwide for a while now: I have found their wines in hotels in Seoul, Korea and pretty much anywhere else I have been (I visited the winery in June 2012, here are my thoughts). I told the owner and he informed me they had more in their storage. So he took me to his upstairs storage facility and there they were: magnums, double magnums, half bottles, lots and lots of Gunderloch. The owner loved riesling, and it was a lot of fun to talk with him. We had a great time that night. The wines we tried were good, the food was wonderful and like I said, the atmosphere was stellar. It was clear that the owners were still trying to figure out what their wine bar would be about and like, but I liked what I saw. I liked it a lot! Over the last 2 1/2 years I followed Crush on an off. I had not been back over Christmas 2011, for whatever reasons, I don’t actually know why we never made it. Their Facebook site was growing, their chef won award after award, and clearly they were doing something (or a lot of things!) right. They were even named one of the Top 100 wine bars in the United States by the Wine Enthusiast in 2011 (not that I am fond of that magazine or its ratings, but still)! Somewhere, deep inside me, I was becoming uneasy about Crush. What if with that growth and praise they were changing, not to the better? We put our names on the wait list and I spotted a bottle of Dr. Hermann‘s H Riesling, one of my go to easy drinking rieslings in Germany. I chatted up the guy in charge of the wait list and he told me they also had an Erdener Treppchen. We had a long chat, he was very knowledgeable, as was to be expected, told me to check out their upstairs sales room. It turned out they had followed through on their plans to turn the upstairs storage area into a sales room, aptly named The Cellar above Crush. I grabbed my buddy Will and we headed up there. And what a great selection of rieslings did we find: Dr. Hermann’s 2009 Erdener Treppchen Kabinett, two rieslings by a tiny producer with stellar wines (Loch winery), Dr. Loosens and other wineries I knew. It was incredible, especially because they only had about 250 wines in total, I would guess. We grabbed the Erdener Treppchen, because it was also quite reasonably priced at $19.50 and had it chilled downstairs. By the time we got back down, the girls had secured a spot at the bar and we were offered complimentary sips of the H Riesling. We chatted with staff and among each other, the bar was still full and I was so glad to be back. One of the bar tenders was actually a classmate of Nina’s; Anchorage is a village. After a while, a table opened up and we moved there. We took the Erdener Treppchen and enjoyed it there. I will write a review of the wine in a separate post, suffice it to say it fit our mood. After that, Nina and I shared a flight of Austrian reds (more about those in another post) and our friends had a Washington riesling. The wait staff continued to be friendly and attentive and we had a great time. We left Crush as they were about to close down. If you ever get a chance, check Crush out. It is kind of my idea of a wine bar: open space, but close knit atmosphere; knowledgeable staff, people who care and know what they talk about; great food; and rotating wine lists, challenging my taste buds and expanding my horizons. If I lived in Anchorage, I would be a regular. 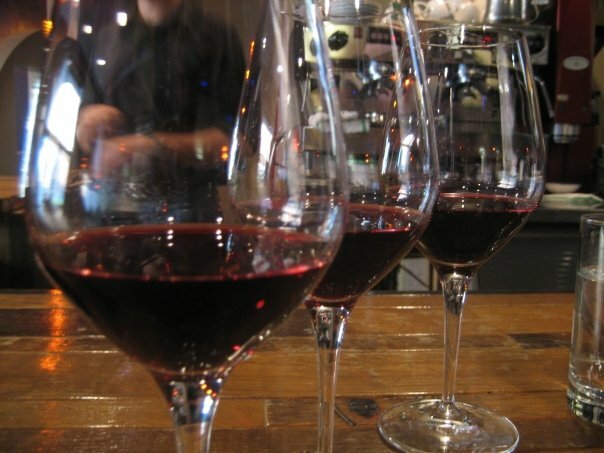 They offer several flights of three wines each for $12 that rotate quite often, from the eclectic to the exclusive. While we were there they had an Austrian red wine flight, a mourvedre flight, a Southern Cross flight (red wines from the Southern hemisphere), a garnacha flight, a “spicy” white flight with wines from Argentina and Spain, and a dry riesling flight. They are on Facebook, too. I love Crush! I’m a regular there and I’m not even from Anchorage (I’m from Unalakleet, a small village up north from ANC.) The staff remember me and what I like and go out of their way to accomodate me. I’m a part of their wine club, and they store them for me until I get the chance to head into Anchorage. I like that area. I have friend’s in Peters Creek. It’s always fun to drive out of Anchorage and see them, even that short distance there’s a different feel. For sure. I like the area and people a lot. I have always wanted to visit Alaska and now that I know there is a decent wine bar there…. Don’t you get more for your money when you buy a good bottle of wine in a wine store. That’s at least my experience..
Hey the winegetter, do you know why my avatar does not display correctly on your blog and/or how that can be fixed?? I think I see your Avatar alright (a map, right?). Do you only have that problem on my blog or on others too? I am using a standard theme from WordPress without alterations, so I really don’t know how to fix a problem like that…sorry. Hmmm. Not sure I can follow. Are you referring to the flights or to Crush’s wine store? If you mean the wines at their store, I thought the pricing was only slightly higher than what I am used to here in AA. Alaska is a bit more expensive than the rest of the U.S., so it seemed alright to me. Yes my avatar is supposed to be a map but I only see the “mystery man”. Might be a problem on my end if you see it correctly :( I have not encountered this on other blogs though. My comment about the prices at the wine bar Crush was supposed be a question. I was wondering whether the prices there were expensive or not since I always found wines to be expensive at wine bars. But you just answered that by saying that they were only slightly higher so thank you :) I did not mean to confuse you! You should go to Alaska. It is beautiful. I bet it is – It’s just really far away as you know. And so far I’ve only see most of the West Coast, parts of the East Coast and some other states like Nevada, Virginia or Washington D.C.
At some point in my life I plan to visit Alaska though :) On pictures the nature in Alaska looks always breathtaking! That sounds like a good place! The couple of wine bars here have a somewhat more “limited” menu. I would guess about 15 wines total. It is certainly an untapped market here. Ugh, that sounds pretty sad. I mean, I don’t want overwhelming selection, but that seems a bit meager.